Why Won't My Car Door Open From Inside Or Outside? When a car door won’t open from inside or outside, it could be for several different reasons. Solving the problem will depend on the logistics of the particular issue, but what you can do will come down to whether or not you have working car keys. This will not be about DIY tips for opening your locked car. Instead, this will be about diagnosing and fixing the problem of a car door that won’t open from inside or outside. There is a feature installed standard with certain types of cars that cause this exact scenario. As a result, the car door won’t open from inside or outside. As long as your key works, this won’t be an issue. But if you have locked your keys in the car, the car lockout is much worse than a traditional car lockout. These come as factory standard for brands like Volvo and BMW (including the Mini-Cooper). This type of measure is classic car security at this point, as it began being used all the way back in the 1980s. Each update in this technology would make it so a car door won’t open from inside or outside with some different catalyst. There may be a button on the door or a sequence of buttons to hit on the car remote, which activates the deadlock feature. Sometimes it is automatic. If You Have the Keys – If you have fully operational keys, getting back into a car once it has deadlocked is not an issue. Maybe you need to get your hands on a working key because your key broke off in the lock, but if you can copy your broken key, that is all you need. With a key, cars with deadlocking features are easy to open. When a car door won’t open from inside or outside because of a deadlock, the best option is to use the key. This is one of the many reasons that it is so important to have a spare car key. Even if you have to call a friend or family member who has a spare car key, it is still a great way to solve your lockout. There is no universal fix for deadlocking that is simple for the average person to perform, so you can either reach to someone who has a key or reach out to a locksmith. If You Lost the Keys – Being locked out of the car with no keys is most troubling when it has deadlocked. If you are looking to get a professional auto locksmith to help, it is going to be the most complicated of the various types of lockouts. It will require a locksmith with some experience to navigate the model’s specific type of deadlock. The ultimate cost to unlock your car is going to be higher than standard because it is likely to require a greater level of knowledge on the part of the technician. Because the car door won’t open from inside or outside, you might need to pick the door lock, trigger crash sensors, etc. Don’t break your window. Unless your keys are inside the car (let alone the trunk), breaking your window won’t do you much good. When you are locked out of your deadlocked car, just call a locksmith. Having a broken lock is almost as bad as a car deadlocking. The car door won’t open from inside or outside, but this will likely only be on a single lock doing this. It is worse than some of the more common car lockout scenarios, but it is certainly not the worst thing that could happen to your locks. As long as you have a door lock that is working, you should have no issues getting into the car to fix your locks. I would not recommend leaving this issue for another day. Trying to work around a car door won’t open from inside or outside by using another door puts you at risk. With many cars, broken locks are the result of poorly manufactured parts. These parts are used throughout the vehicle, so it is only a matter of time before your other locks break and you are left in a very bad situation. If You Have the Keys – When a car door won’t open from inside or outside due to a broken lock, use your key to open the lock that is not broken. With this level of access, you can address the broken door lock. You probably do not want to do this yourself, but it is possible to merely purchase replacement parts for the door lock and fix yourself. In cases where you are going to do this work yourself, be careful while taking the door apart (by removing the panel) to gain access to the car’s lock. Check the connections between the inside locks and the car door lock cylinder. Look for what has broken, because if the car door won’t open from inside or outside, it means there is a connection issue. With the door opened up, try to actuate the lock from either side and see how the moving pieces are not interacting. If You Lost the Keys – You will need to get back into your car in general. Because the car door won’t open from inside or outside, ignore that door. Use whatever method you feel comfortable with to open a different car door lock. Once you have regained access to your car, it is time to get a new car key and then replace your car door lock. You will have to deal with the cost of making a new key and the cost of repairing or replacing your car door lock. How you go about each of those processes is up to you. You can pay for parts and try to do the work yourself or you can reach out to a professional. What matters most is that you replace your key and fix the broken lock. If you have been in an accident, you may havedamaged the door in a way that keeps the car door from opening altogether. When a car door won’t open from inside or outside because the door itself has been damaged it is almost always a bodywork issue. Though the car is not deadlocking and the lock is in working condition, the door cannot escape the door frame. This issue can be obvious or rather subtle. Because it is likely only one door causing the problem, check to see if unlocking the door the conventional way moves the switch or post locks to the unlocked position. When you can see that the locks are working, but the car door won’t open from inside or outside, the issue is with the door itself. If this is your issue, it will not matter whether you have a key or not. Most people will need to replace their door, and hopefully not the door frame. This is going to be expensive because it is structural damage to the car. When a car door won’t open from inside or outside in this way, a locksmith will not be your go-to solution. A mechanic that can do body work is your best available option for this type of problem. Be cautious of trying to get the door back to working order yourself. When prying a door or wedging, too large of an uncompromising gap can damage the door further and even cause the window glass to break. Check to see if there are any doors that will open from the inside or outside. When you are taking your door panel off the car, be sure not to damage the plastic latches. Examine the moving parts in the open door while you actuate the lock from both the inside and outside. You will need to get back into the car in order to solve most of these issues. When interacting with the inside of a car door be very careful not to disturb wires that may be for alarms, automatic windows, or even airbags. Do not be afraid to call a locksmith when a car door won’t open from inside or outside, you are likely to need them for some type of service. In most cases where a car door won’t open from inside or outside, you are going to eventually need a locksmith. When it comes to the worst instances of a car door not opening for the inside or outside, you may need the assistance of a mechanic. 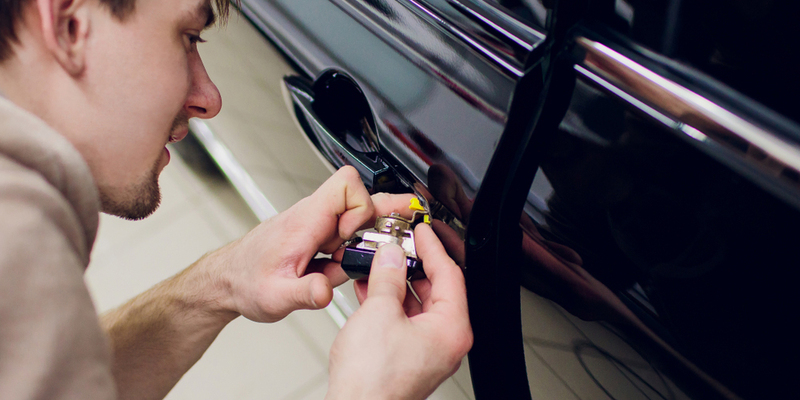 If you are at all confused or uncertain about performing any of the solutions yourself, do not endanger your car further, reach out to a quality automotive locksmith.